Cystic Fibrosis (CF) is an autosomal recessive disease and the most common lethal genetic disease in Caucasians. It occurs as a result of a mutation in CF gene, which is found in chromosome 7. 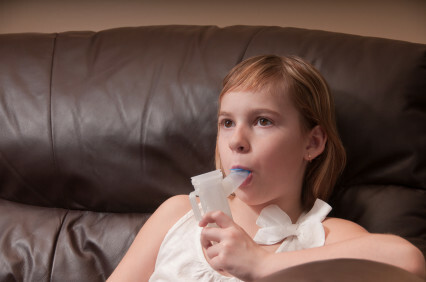 The CF gene regulates the production of the cystic fibrosis transmembrane regulator protein (CFTR) protein which is needed to regulate sweat, digestive fluids, and mucus. 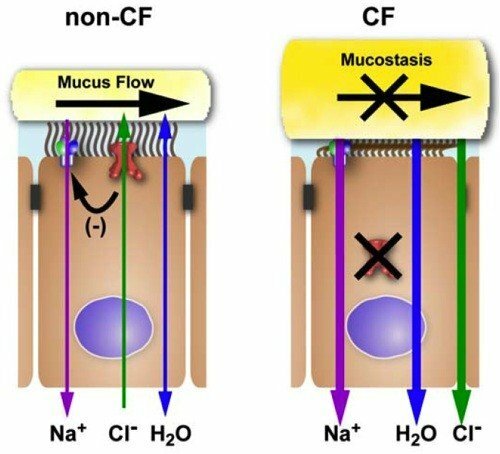 Normal patients who have 2 genes for CF will experience no issues with the movement of Cl- and Na+ across their epithelial membranes. However, those with 2 abnormal CF genes (most commonly the delta F508 mutation) will experience impairment in Cl–, Na+. H2CO3–, and H2O transport. CF patients are highly vulnerable to colonization by resistant, virulent organisms due to thickened lung secretions that facilitate their growth. Infection by B. cepacia often eliminates a CF patient from eligibility for a lung transplant. Treatment with antibiotics occurs in two forms: oral and aerosolized. Aerosolized treatment involves cycles of 28 days on and 28 days off; usually with nebulized tobramycin, aztreonam, and colimycin. The pancreatic duct is often obstructed in CF due to thickened mucus secretions. This leads to a decreased production of pancreatic enzymes such as amylase, lipase, protease, and bicarbonate; all of which are responsible for the breakdown of ingested fat, protein, and carbohydrates. Supplementation with enzymes prior to meals and snacks is essential for growth and development. Patients may require proton pump inhibitors such as omeprazole due to both impaired bicarbonate secretion by the pancreas and inactivation of pancreatic enzymes by acid. If a CF patient is on a PPI for >2 years, supplementation with both calcium and iron may be needed to prevent PPI induced osteoporosis. CF Related Diabetes (CFRD) often occurs as a result of a combination of both Type I and Type II diabetes: decreased insulin production and increased insulin resistance. 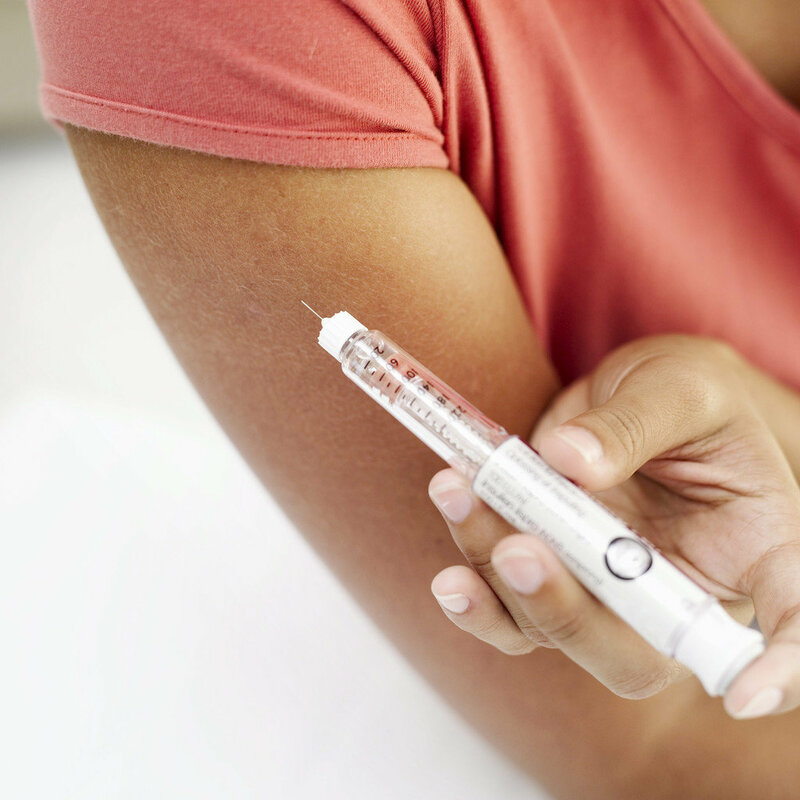 However, unlike regular diabetic patients, CF patients are managed using only subcutaneous insulin (e.g. regular, glargine, and detemir). Oral agents such as metformin and sulfonylureas are not recommended.